Sorry birdie, but you're not going to get out through the trapezoids. 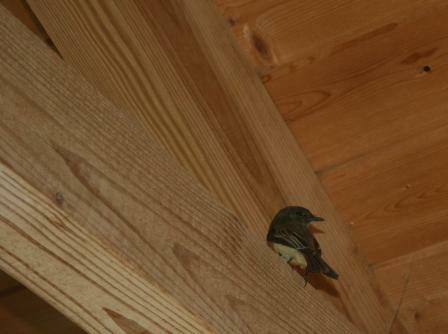 Next the bird flew up into the ceiling beams. Our ceilings are really high up, as we have an A frame log cabin. From his point up on the beams, he was able to poop on Paul's shirt. I guess that little bird figured that's what he gets for leaving his laundry out in the middle of the living room. Finally, he flew right behind the computer in our office loft. And then waited for me to scoop him up. See the squinty eye. That meant he was scared. So I quietly carried him downstairs to set him free. Gently placed on the porch railing. 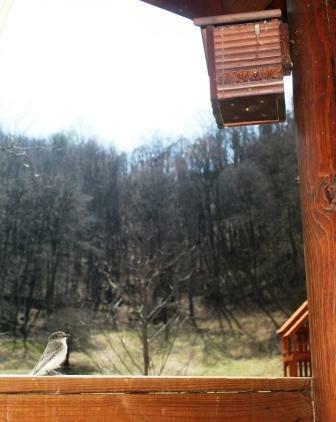 I think he's eyeing our bluebird house. Sorry birdie, it's already taken! Linking this up with WV Treasures Show and Tail. I had to redeem myself after my last entry. I bet the boys loved having the bird inside. Okay you are the coolest and I am not. I would have been flapping around all "eewggh" just as much as the bird! I'm always somehow 'afraid' of them in confined spaces. One too many Hitchcock movies I guess. I'm also afraid I'll go to "help" them and hurt them or something. I tend to just wave "go outside birdie. Go HOME!" and hope they get the message. Gosh, you're brave. I couldn't have picked up the bird like that. Poor little guy. I'm glad you saved him. Wow1 That must have been an adventure. You must have a very calming spirit, because that bird didn't seem too scared. Congratulations on catching it. It was fun to see it come out alive and happy. I agree about the teacher! 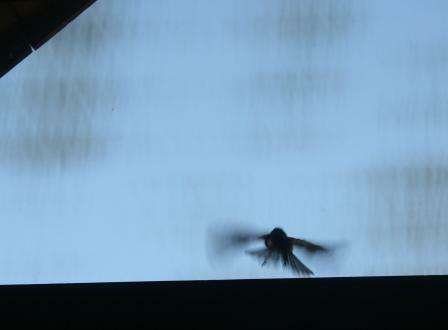 We had a hummingbird get in our garage. It had knocked itself half out flying into the wall, I assume. When I picked it up I realized it was not dead, but stunned.It was like a jelly sack. They don't seem to a structure to them if that makes senses but feel like sack of gel with no bones. I placed him outside near the humming bird feeder in the shade. He did recover and fly off. We once had a bird in our house too and it was quite a round of excitement! I LOVE that you were able to catch that little bird without him having a heart attack in the process! Great job! He must have been worn out for you to be able to catch him! Good thing he didn't try to fly through a window full speed and knock himself out. Lisa, so glad the birdie was snatched up and released unharmed. Birds are pretty amazing little things-and I'm glad you safely got this one outside. I was trimming Amy's parakeet's toenails once, and she bit me and my reflex was to drop her! I had a time catching her again-she had the squinty eyes too. Wow, he let you catch him with your bare hands. :-) Nice close up shots. You are way braver than I am! lol I'm glad you were able to catch that little birdie! We had one a few years ago that built a nest in a basket I had just put on our front door. Let me tell you they can build a nest fast and lay those eggs pretty fast too! 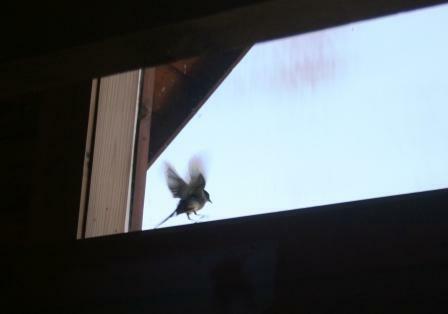 Anyway, when we would open the front door the mama bird would fly into the house. 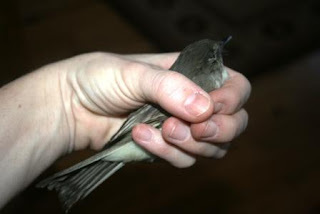 We would manage to get it to fly back out but not before it had the grand tour of the house! After the second time it flew in and broke one of my prized WV Glass vases with the roses on it my husband took the basket over to a tree and put the nest in a tree. The basket went back into the garage. I can't hang anything on my front door without a bird trying to build a nest in it. Even a wreath. You got great pictures to illustrate your story! I'm glad you got him out before he pooped all over everything!! Sometimes a bird gets loose in a store around here, none ever came in our house, only bees and wasps. Oh wow! I can't believe you caught him! 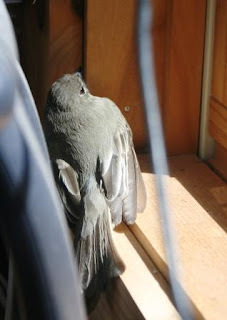 I had a mockingbird in the garage yesterday. He banged into the storm door a few times until a cat and I persuaded him to leave. Today, he flew back in but figured out how to get out on his own pretty fast. So cute! I am trying to figure out what kind of bird he/she is... looks like some sort of finch. 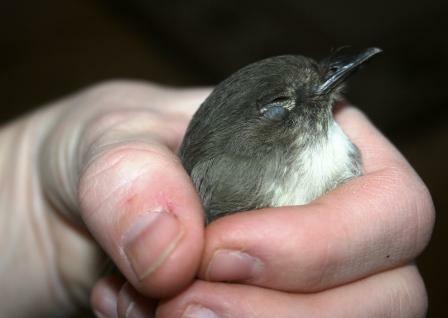 When I was young, it was my "job" to rescue any birds that found their way into our house. They would sit on the chimney and get dizzy from the natural gas that came up from our furnace and they'd fall down the chimney and I could hear them moving around, so I'd open the door at the bottom and take them to the great outdoors once again! You are a hero to save him! There is no way I would have been able to scoop up a bird in my hand. I'm fond of birds but only when peering at them out my window. OMG. You are amazing. I would have been freaking out! Good for you for setting the poor thing free to be on his/her way!